How to watch November’s weekend meteor showers. 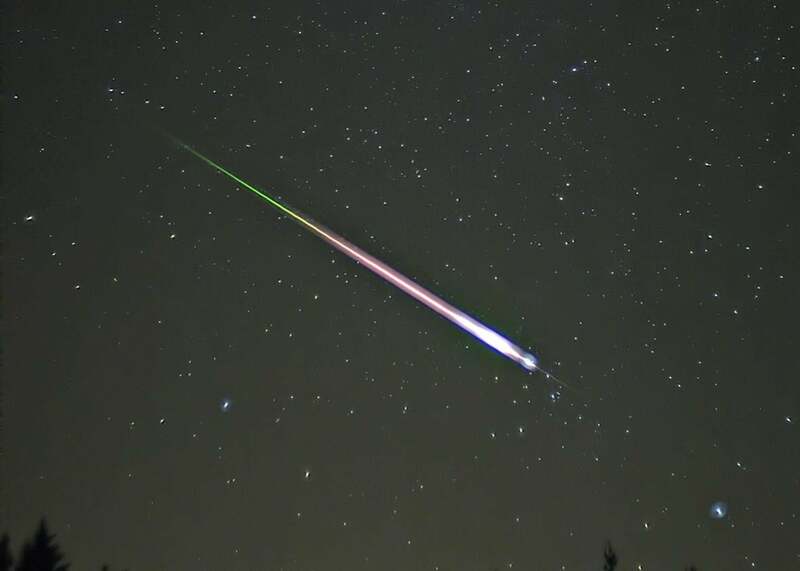 A meteor during the peak of the 2009 Leonid meteor shower. The photograph shows the meteor, afterglow, and wake as distinct components. Late fall is usually the last opportunity to spend several hours outside at night without losing feeling in your extremities. You should take advantage of this chance and watch the two major meteor showers on the way for the month: the Taurids and the Leonids. The Taurids, which are caused by debris kicked off by the Comet Encke, will peak on Friday and Saturday. Although the moon is going to be waning during its last quarter, there should still be an ample amount of darkness for the Taurids to be visible, especially around midnight. The Taurids take their name from the constellation Taurus, from which the shooting stars appear to emanate. The bull-shaped constellation is Orion’s neighbor, so if you’ve got a sense of where to find Orion or the three famous belt stars, try to stick your eye on that constellation first. Then, look for Taurus’ V-shaped cluster of stars, which are called the Hyades, and from there you should have a focus for the center of the constellation. You should be able to see between five and seven meteors streaking through the sky every hour. That’s certainly a slower rate than many other showers, but that modesty is balanced by the brightness—there will be some intense fireballs, a type of very bright meteor. The Leonids, as you might predict, can be spotted streaming out of the constellation Leo. In the fall, look toward the eastern sky, and look for a pattern of bright lights making up the shape of a backward question mark. The bottom is a star called Regulus, which should guide you to the rest of the constellation. The source of the Leonids is Comet Tempel-Tuttle. You should expect to see about 10 to 15 meteors zooming through the sky per hour when the Leonids peak around 3 a.m. local time. The best way to watch both meteor showers is, as always, to find a spot in the countryside or less crowded suburbs. You’ll have a hard time watching either of these spectacles in the city, especially with the moon out for the Taurids and a fainter version of the Leonids rolling around this year. If you’re having trouble figuring out where to look in sky for the shooting stars, download a constellation app on your smartphone to help you out.